The money is in the list! …I know that saying is bordering on cliché – everyone tells you to build a list. But they do it for good reason. Building a list of email subscribers really is the most important and profitable thing internet marketers can do in virtually any niche. Now there are several ways you can use your blogs to build a list. The standard method is to just have an opt-in form on your sidebar much like I do on this blog. Our Covert Social Press theme has an inbuilt function to serve an unobtrusive pop-under ad when someone clicks on something – and that’s a great way to show them a squeeze page. There are tons of list building plugins for WordPress out there too, ranging from adding an opt-in form at the bottom of your posts, to showing fancy light box pop-up squeeze pages. Our own Covert Messenger and Covert Action Bar plugins are great for getting people to click on something – and it would be a very good strategy to send them to a squeeze page. However, all of that is really just methods of displaying your opt-in form – important yes – but only one small step towards getting people to opt-in. There are 3 additional critical components you need in order to successfully build a list from your blogs. Even if you have the best offer ever laser targeted to your audience. It still won’t work if your squeeze page fails to convince them that is the case. You need a professional looking squeeze page that both inspires confidence in the viewer and makes them want what you have to offer. This of course is the whole point of list building in the first place. When people opt-in you need to a follow up email series in place and it needs to do 3 things; deliver your freebie, build a relationship with your subscribers and most importantly convert them into paying customers. While getting your opt-in form or squeeze page on your blog in some form is pretty easy. Completing the 3 crucial steps above can be a bit hard, especially if you don’t know how. #1 You will be given two brand new, surfer stopping squeeze pages that convert because they ooze the professionalism and personality needed to build trust and snag the subscription! #2 You’ll get 2 products to give away or sell that you’ll be PROUD TO PUT YOUR NAME on, out of the box! Because… rather than slaving at researching and writing to create new content every month, these new products will be actually be teaching YOU cutting edge techniques and tactics! #3 Stop wondering which markets make money! All of the packages you will get will be centered on evergreen niches that are proven moneymakers day-in and day-out! These are products that pertain to what people need and want all the time in areas they are willing to SPEND, SPEND, SPEND! #4 Follow Up already Followed! After your visitors jump on the subscription, you can give them more of what they want – included within this single package! You’ll get autoresponder follow series, already written, for both products, chocked full of information your subscribers will love and love you for giving them! In addition, they will be sprinkled with the perfect pre-screened and profitable product links, your subscribers will surely devour! All you’ll need to do is update the links with your affiliate id using the handy product list that is supplied to you and WHA-BAM, instant profits on autopilot! 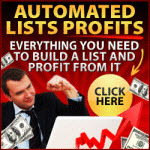 And right now you can get a Life Time Platinum membership at Automated List Profits for one low fee. That means you get the entire backlog of 30 list building packages, plus two new ones every month – without ever having to pay another dime! In addition, to creating working squeeze pages in just minutes… with Squeeze Ninja you can also add matching monetization pages, effortlessly to generate affiliate commissions, or sell your own product, at the same time! But it does not come with the ready made products, squeeze pages and follow up emails like Automated List Profits does. Both are highly recommended solutions though – so click the banners below to see which one is the right solution for you and your blogs! Previous Previous post: Three Proven Ways To Get More Traffic To Your Blog, Fast!